Intermediate cyclists or mountain bikers who have basic off-road skills and reasonable fitness will love the blue graded Border Counties Railway route. There are small amounts of challenging features (man-made and natural) but most of the gradients are moderate. Some short steep sections may have to be walked. Distance 5.5km (return using same trail) = 11km Route follows 80% former railway line. This is a short trail on mainly level terrain making it ideal for a family day out. The trail uses the former railway line to Scotland and when cycling along you can see how the former railway line carved its way through the landscape. As this trail goes through open farmland the scenic view is different to anywhere else in the Park and in the distance you may even be able to see the Scottish Border hills. 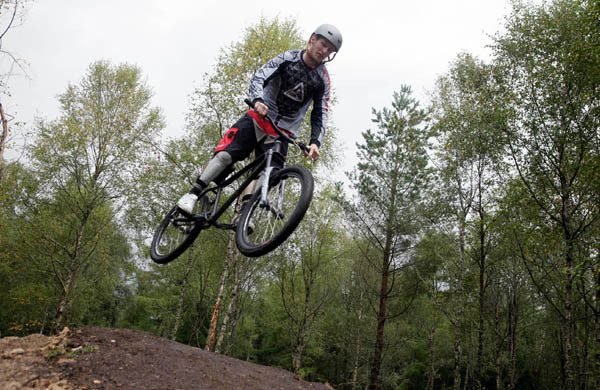 Begin your day at Purple Mountain or the Bike Place Kielder - both offer cycle hire but also great advice and tips on mountain biking in the Park. Once you’re kitted out, make your way to Kielder Castle car park where the trail begins. It heads downhill for a short section and from here the trail goes through the Kielder campsite. A short section follows the C200 road (Bellingham to Newcastleton/Jedburgh) and then you will enter the forest to rejoin the former railway line. The ride should take around an hour and a half (depending on how often you want to stop and enjoy the view). Back at Kielder Castle, drop in at the Duke’s Pantry tearooms for a hearty and well earned lunch. For more information on the former railway line, why not pop into the Bellingham Heritage Centre that afternoon.